Posted 7/2/2010 4:16pm by Gregg Keckler. If you are signed up for the second session, we are getting geared up for the summer fruits and vegetables. This year everything is early- so we are already picking green beans, summer squash, and zucchini. We got our first peaches this week. We have tons of blueberries and raspberries right now. We are pulling all the lettuce next week and plowing and tilling to prepare the ground to plant something else. You will get an email from me explaining pickups, extras, and other things by July 12. Posted 6/28/2010 10:03am by Gregg Keckler. We had quite a few subscribers send us recipes they tried with some of the produce from their boxes! Here are just a few of them! Thank you for the rhubarb! We hadn't tasted it before. At first we tried a raw chunk. Too intensely tart for us, and tough/stringy outer layer. So I checked some cookbooks & easily made a rhubarb sauce, very yummy. Peel the stalks, cut into chunks. Put in microwave w/ honey/sugar a few minutes, until soft. Add bit of lemon juice, bit more orange juice. let cool. Puree in blender. Add cinnamon. Great on granola or cereal or frozen yogurt! Your strawberries & apples are incredibly flavorful & delicious! In case you haven't used your peas yet (the ones that require shelling), I discovered a fab dish last night so am sharing it with you here. After I shelled the peas, I had less than half the amount called for in the recipe so I halved the recipe and it was fine. In fact, it was *insanely* tasty. I should also add that I'm giving you the recipe as it's written, but I didn't have any mustard seeds, curry leaves, turmeric or green chiles and it was still insanely tasty. And I forgot the basil. I think that even if you only had cumin, coconut and cilantro, it would still be great. Good flavours. Put oil in frying pan and when hot, put in mustard and cumin seeds until the mustard seeds start to pop (a few seconds if the oil is hot), and then add the curry leaves. Stir for a second and then add peas, chiles, salt, sugar, turmeric, cumin and coriander. Stir for a minute until peas are bright green. Add 4 Tbsp of water and bring to a boil. Cover, turn down the heat to low, and simmer gently for up to five minutes or until the peas are tender. Uncover, turn the heat up to medium-high, add the coconut and cilantro, and stir to boil away any remaining water. Serve immediately. Serves 3-4 people. Chop and boil in just enough water to cover along with cubed potatoes and chopped onions. When it is well cooked, drain. In a frying pan toast a couple spoonfuls of flour, add butter, garlic and vegetable stock to make a gravy. Add the strained vegetables to the sauce. It was absolutely delicious and disappeared in 2 seconds (even the kids loved it)! I just wanted to let you know that the snow peas from last week were DELICIOUS! I steamed them for 3-4 minutes and they were perfectly sweet and crunchy. Bake at 400 degrees for 30-40 minutes (my version: 30 minutes). Watch for burning. Top with frozen cool whip or vaniall ice cream! heat, and cook 10 minutes or until chicken is done. (about 9 minutes). Serve with chicken. This is a simple, classic way to cook greens. I've used it with swiss chard, beet greens, kale, even spinach. The key to this dish is developing a great fond on the bottom of the pan with the pancetta and onions, then deglazing before adding the greens. Making this in a skillet or sauté pan without a non stick coating (a stick pan?) results in much more flavorful dish. If you don't have pancetta on hand, you can use a strip or two of bacon. I'm not a fan of the crushed red pepper you can buy at the grocery store. I get mine from Penzey's, and it has a much bolder flavor with the same amount of heat. After cutting the pancetta into pieces (approximately 3/4 of an inch), place it in a preheated pan on medium-high heat. Stir occasionally while it browns, and cook for 2-3 minutes. Add the onions and sauté until they are soft and translucent, deglaze the pan with a bit of water, scraping up all of the brown bits. Let the water evaporate, and sauté until the onions just begin to brown and another layer of fond starts to stick to the skillet. Add the garlic, cook for 1 minute, then deglaze the pan again. Add the greens and the remaining water, season with salt, pepper, and crushed red pepper, stirring to mix well with the onions, pancetta, and garlic. Cook until greens are tender, stirring occasionally. Hi, I just read an article in Runner’s Magazine about Sour Cherries. They are apparently nature’s painkiller. It says sour cherries are good in cobbler and pie and folded into quick-bread batter. The magazine gives a recipe for sour cherry syrup. Boil four cups pitted cherries with ¾ cup sugar and ¼ cut water for 10 minutes (add a splash of lemon or lime juice if you like.) Pour into a jar and store in the fridge. The furit can be ladled over waffles or ice cream or combined with seltzer for cherry soda. Preheat oven to 350 degrees. While preheating, melt butter (in the oven) in the pan you will be using to bake the cobbler. Combine flour, sugar, milk, baking powder, and salt. Pour batter into the baking dish on top of the melted butter. Dump fruit on top. Do not mix in. This is what it looked like: http://www.flickr.com/photos/cransell/3719521655/. So yummy! Spray an 8 x 11 inch rectangular baking dish with cooking spray (bottom and sides of pan). Slice yellow squash, zucchini, and onions into circles, ½ inch thick. Layer yellow squash, zucchini, and onion in prepared pan. Place yellow squash slices, flat side down, on the bottom of the pan. Add zucchini slices, flat side down, on top of the yellow squash slices. Finish by placing the onion slices on top of the zucchini slices. Sprinkle cheese over the layer of onions. Place strips of un-cooked bacon on top of the cheese completely covering the cheese. Posted 6/28/2010 8:30am by Gregg Keckler. The red and yellow raspberries and blueberries are coming is strong right now. The black raspberries are almost over. We let the chard rest for a week so this week we will do chard again. Hopefully there will be enough for bigger bunches. We did get some rain yesterday so that should help. This week we are staking up tomoatoes, picking currants, blueberries, red beets, raspberries, apricots, squash and cucumbers. The apple have been thinned. We want to apologize to those of you who were disappointed with the sweet cherries. We aren't stupid. We know they weren't very good this year. We made the choice to give them in the shares anyway. That was possibly a bad choice, since many of you were annoyed by the quality. What can I say - we tried! Between splits that molded and brown rot which ruins the sweetness and tecture. They were impossible to keep after this year. If it is any consolation,no one else had any good ones around here. That is one aspect of farming that goes unnoticed. Last winter we took the time to prune those cherres. We sprayed those trees throughout the spring which took time and money. Then we took time to pick the cherries. and then what/? Bad cherries. So all that work, effort and money that went into them is a loss for this year. The gamble of farming. This marks the 5th week of this session. If any of you want to sign up for the second session in spite of the bad cherries - now is the time. We will take folks through July 10. You can send a check ( you do not need to send a subscription form) or you can give it to us at one of the markets. The shares this week will include: Swiss chard, kale, red beets, squash/zucchini, sour cherries, apricots, and blueberries. Posted 6/14/2010 7:58am by Gregg Keckler. We are picking lots of peas. Enjoy the peas now since they have such a short season compared to summer squash or tomatoes. We are beginning to pick raspberries and zucchini and summer squash. Oliver picked about a dozen blueberries yesterday. So it won't be long. This year weather patterns are a bit different then the past few years. 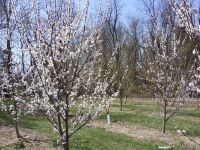 We had 90 degree weather in April which forced fruit trees to bud early. so we have sweet cherries already and the earliest apricots are in. Unfortunately there don't seem to be as many sweet cherries as other years so enjoy them this week. Do not forget your coolers or boxes. Please bring them back every week! We are coming up short. Also remember to return all containers and jelly jars when you are finished with them. We can reuse these. If you have a good recipe for any items, please send it to us or post it on the blog. Swiss chard is excellent sauted with onion or garlic. The leaves are great raw in cold salads or sauted like spinach. Give it a try. This week: strawberries, sweet cherries, Swiss Chard, lettuce, spring onions, snow peas, sugar snap peas. the snow peas and sugar snap peas are edible pods. Posted 6/7/2010 8:10am by Gregg Keckler. This week we are beginning to pick raspberries and sweet cherries. We are picking tons of peas as well. Asparagus is waning. We are weeding constantly. If anyone wants to come to the farm and do some weeding for therapy, give us call. English shell peas must be hulled - eat only the peas. Snow peas are edible pod. Swiss chard leaves can be used for cold salad or the stalks and leaves can be steamed or stir-fried with a little oil or butter and garlic. Delicious! Last week went pretty well, but this week will go even better! Sorry, we will not have any steaks until after Wednesday. See you this week! Posted 6/1/2010 1:43pm by Gregg Keckler. We are picking strawberries, peas, spring onions, radishes, and cutting salad greens. We are planting the last of the tomatoes, okra, peppers, and next week we will plant lima beans. The red beets, beans , raspberries and blueberries look great! Posted 5/31/2010 3:41pm by Gregg Keckler. Thank you for your emails. I stopped by your farm stand on Saturday at the Cedar Lane UU Church. It was nice to meet you. I picked up some pink lady apples, asparagus, salad greens, baby radishes, and some pumpkin bread. Everything was delicious and very flavorful. My kids enjoyed the apples the most and I enjoyed the asparagus, but everything has already been gobbled up. I’m really looking forward to the start of the CSA sessions and hope to visit you at your stand again this Saturday. Thank you again for making this opportunity possible. Posted 5/31/2010 8:03am by Gregg Keckler. We have planted out almost everything from the greenhouse. Things look great this year! This certain red lettuce actually looks so good that the rabbits will not let it alone. The peas have flowers, so next week hopefully we will have snow peas. We have a few sugar snap peas already. If you have never cooked with rhubarb, here is a simple way to prepare it. Chop the stalk into 1 in. chunks. Cook in a pot wil a little bit of water until the rhubarb is soft. You can add strwberries if you want a bit of color and sweetness. After it is stewed, you can add sugar or honey to taste. I love to eat it just like this. Some folks eat it with a biscuit, use over ice cream, or crumble oatmeal, brown sugar, flour and butter for crumbs. and sprinkle over stewed rhubarb. Don't forget that you can eat the bulbs and the stalks of spring onions. (Geat in salads, soups, with pasta or potatoes) Let me know if you have trouble figuring out what to do with anything. This week's share will include: strwberries, apples, radishes, spring onions, lettuce heads/salad mix, rhubarb, asparagus. We had a steer butchered on May 20, but it isn't quite frozen yet, so if you ordered any steaks, you may not get them until week 2. We have ground beef in one and half pound packs. If you order ground beef you will get these packs. Ed Breckenbill is out of smoked sharp cheddar right now, but we will get some the next time we order. Please return all berry cartons, egg cartons, jars, etc (even rubber bands are helpful). You can wait until you empty the containers and then return them. This is our hopeful time schedule. After the first week we will see how things go and make changes if needed. Looking forward to see everyone this week! Posted 5/17/2010 10:32am by Gregg Keckler. Welcome to the 2010 CSA season. If you are getting this email, you should be expecting to pick up a share on June1, June 2, June 3, or June 5 for the first week of the season. If you don't think you should be picking up this week, let me know. For some this is a new experience, for others it is a continuation of fresh fruits and vegetables. Gregg, Oliver, Mark, Lydia, and Virginia have been busy planting out hundreds of tomatoes, pepper, squash, and cucumber plants last week. The fruit looks good. There might not be as many sweet cherries or apricots as last year, but the plums look better. It is hard to predict why these fluctuations happen each year. If the spring is too cold, the trees don't flwoer, if it is too chilly and overcast the bees don't pollinate the flowers, and there are some years that a tree just decides to take the year off and not produce any fruit. who know! We want you to get the most out of the fruit and produce that you get. We have some simple preparation tips on the website. Remeber that you do not need to create a dish based on a vegetable ( for example: asparagus) Asparagus is delicious raw, lightly steamed, or grilled - no other ingredients necessary except a little butter or loive oil and salt. Preparing simply will give you the best flavor and nutritional value - and it is simpler. Logistics: All folks getting their shares on Tuesday at DOT or Gangplank Marina, Thursday at East Columbia Library, Saturday at Cedar Lane UUChurch in Bethesda, Saturday at 128 Goucher Lane, Gaithersburg, or Saturday at the Westminster Farmers Market will pick up coolers each week. You will bring back an empty cooler and pcik up a full one. If you choose you can put youritems in your own bags and just leave the cooler with us. Folks getting shares on Wednesday at NGS, NLC, Clavert Foundation, NIH - Fisher Lane, or Kennedy Center(25th st NW) your produce will come in a box with your name on it. You can take the produce and leave the box in the designated drop off spot or you can take the box with you. Please return the bos before the next Wednesday pick up. I will be in touch with each of you regarding the actual drop off spot. NGS will be the same as last year. Extras: you can order extras weekly by sending us an email AT LEAST one day before delivery day. You can pay for the extras at the market with csah, check, or credit card(If over $15.00) If you pick up on Wednesdays orat the Gangplank Marina, or Gaithersburg you can order items, we will put them in your share and at the end of each 7 week session we will send you a bill by email and you can send us a check by mail. We will have our own fresh, free range eggs all year. Our chickens are young and laying prolificly. We will have our own hormone-free grass fed beef available. We are having another steer butchered this week so we should be stocked with all cuts of steaks for a while. We will also have our own sweet butcher bologna. We put a whole steer in bologna so the bolonga is Lean and delicious. Butcher bolonga is stored in 4 in round cloth bags. we sliced it thinly and put it in 1/2 and 1/4 lb pakcs to sell. We also sell butter from Apple Valley Creamery www.applevalleycreamery.com The butter is from hormone-free pasture fed dairy cows. We will again be offering Ed Brekenbill's cheese. Ed has a hormone-free pastured dairy in Chambersburg, PA He makes all of his cheese at his farm. He adds no additivies, only raw cow's milk, vegetable enzymes, and sea salt. Posted 5/4/2010 2:07pm by Gregg Keckler. The countdown is on! By May 15 we will be planting all our tomatoes, peppers, egg plant, summer squash, and zucchini. We are cutting tons of asparagus and lettuce, Our spinach is coming on slowly. The shell peas, sugar snap peas, and snow peas are looking good. This year the shallots look great (compared to last year). We are picking spring onions and radishes. The rhubarb is very thick. Last week we had a single stalk that weighed over 1/2 lb. We should be picking red beets in a couple weeks. Our chickens are laying heavy, so we have plenty of eggs. We are actually selling some at market because there are so many. All the fruit looks great. Strawberries have lots of flowers. Our berries are later then Maryland or Virginia because we are further north. But hopefully we will have berries by the first week of June. Gregg has planted some unusual winter squash, watermelon, muskmelons canteloupe and of course prickly pear seeds in the greenhouse.